FAGE (pronounced FA-yeh), the first major Greek yogurt brand in the U.S., has expanded its Total 0% line with flavored yogurts. In addition to the original plain yogurt, those who want to cut out the fat can enjoy the rich, creamy, triple-strained yogurt in Blueberry Açaí, Cherry-Pomegranate, Honey, Mango Guanabana and Strawberry Goji. Each 5.3-ounce container has 120 calories, zero fat or cholesterol, 11g protein and 19g total carbohydrate (including 16g sugar). One serving contains 15% of your Daily Value of calcium. The flavoring is kept in a separate compartment to maintain the integrity of the yogurt until right before consuming. 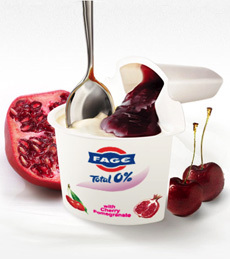 FAGE began in 1926, when Athanassios Filippou opened a small dairy shop in Athens, Greece. It was a rural neighborhood with a single train station nearby. As travelers came and went, Filippou’s store gradually became known for its creamy and delicious yogurt. Still family owned, the company is now Greece’s largest dairy company, producing milk, cheese and yogurt for customers worldwide. FAGE opened a United States plant in Johnstown, New York in 2008. It is the only Greek company producing Greek yogurt in the U.S. Learn all about yogurt in our Yogurt Glossary. See all of our favorite yogurts, recipes and more. Read our review of FAGE Total Yogurt.